The Skycap News team recently had the opportunity to travel and enjoy the Great Smoky Mountains. 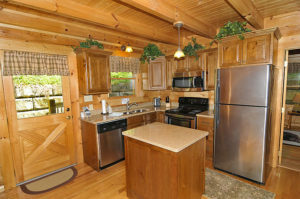 Our mission was to seek out the very best in Pigeon Forge cabin rentals. This visit also afforded the privilege of numerous opportunities in the pursuit of the latest travel news and reviews. Rest assured, we will be updating several of our pages over the next several weeks and believe us when we say we have plenty of new material! 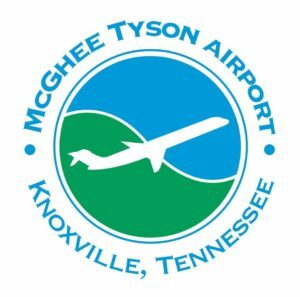 For those of you looking for flights to the Smoky Mountain area it’s fairly simple as there are really only two somewhat close regional airports. The closest being located in Knoxville, Tennessee (TYS) and Asheville, North Carolina (AVL). This creates a challenging scenario, especially when it comes to finding a budget friendly flight. 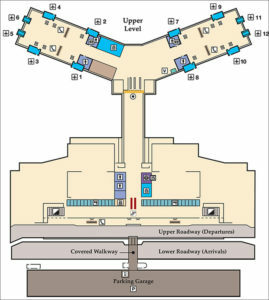 Major airlines American, Delta and United currently serve TYS. 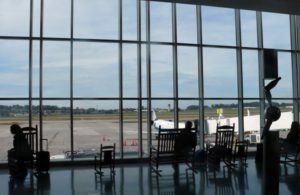 “Low Fare” carriers Allegiant and Frontier also provide scheduled air transportation. While driving to the Pigeon Forge area from TYS we were able to experience some amazing views as seen on Wears Valley and then Walden’s Creek Road. One word of caution is be prepared for some traffic but, don’t let this hinder you vacation spirit or driving style. 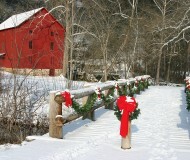 Upon arrival we were greeted by twin covered bridges and then a friendly front desk staff. 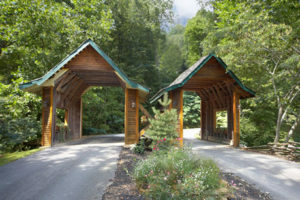 We were sincerely impressed that this is a private gated community, ensuring only owners and Pigeon Forge cabin rental guests have accessibility. In this day and age, travel safety is paramount. It was clear that this resort community is different from most of the Pigeon Forge cabin rental facilities. 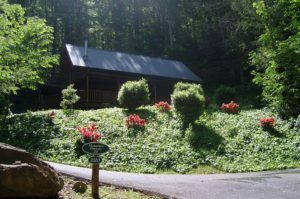 We immediately noticed that each log cabin available for rent features an extremely private wooded setting or stunning views of the Smoky Mountains. 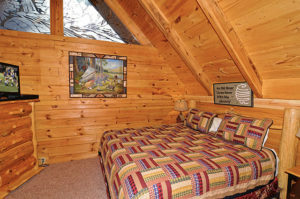 Upon arrival at cabin #24 we were very pleased to discover “Mountain Dreams” has both! Once settled, it didn’t take long to unwind and comment that the air just seems to breathe cleaner and easier while staying at this cabin. “Mountain Dreams” exhibits an open concept lower floor and features a stacked stone wood burning fireplace. How authentic! The signature hearth takes on a rustic look with a huge locally (front desk info received) sourced log mantel. Fans of Direct TV will be pleased that they will be able to enjoy their favorite shows and/or sporting event(s). Settle into the love seat or perhaps or sink into the leather couch/sleeper or low-profile swivel chair. The main floor living area is indeed an excellent spot to chill out and plan the itinerary for the remainder of your visit. The lower level of the cabin invites “sleepy heads” with a King size bedroom and ample bathroom, shower and storage space. Ascend up the staircase to the second level that offers another spacious bedroom. Please take note of the superbly etched extra large plate windows. Truly something one doesn’t see everyday, or night! The second floor also has a couch that converts into a sleeper bed, super comfy love seat to check out yet another flat screen TV and an awesome game room for that spontaneous pool tournament with your family or friends. Seek out your innermost “pool shark” and shoot endless hours of games without any quarters needed! 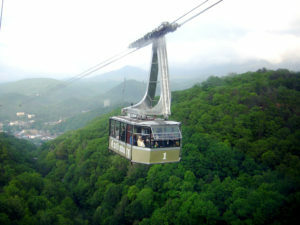 Walk along the catwalk to the second top deck that showcases another beautiful Smoky Mountain view. 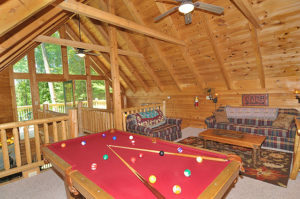 Enjoy a coup of coffee on the deck in the morning or an adult beverage when your body clock chimes “beer thirty!” Amazing views without other guests able to witness your every move or sound as with many other Pigeon Forge cabin rentals. The only guests we saw were numerous birds species including twenty plus wild turkeys that came to graze on the side lot a couple of mornings. Talk about wildlife at its finest! In case amazing views and relaxation aren’t enough, the intimate “Brothers Cove” resort has high-end amenities available to each person who rents one of the unique log cabins. 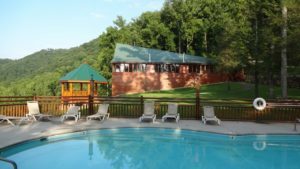 Of particular mention is the picturesque “Cement Pond” aka swimming pool that has one of the most breathtaking views anywhere in Smoky Mountains. Taking a dip in the pool was a refreshing experience and new “wedding party” friends were made as well. Speaking of weddings, it is rather easy to see (pun intended) how couples looking for a perfect place to perform their nuptials would be wise consider the Lodge at Brothers Cove. Absolutely striking to say the least! 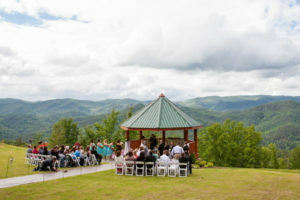 It is doubtful one can find a more perfect setting in the Smokies to get married or to “pop the question!” The gazebo located hillside provides the “storybook wedding” setting most women have been dreaming of for a lifetime. . . complete with a beautiful long-range Smoky Mountains valley view below. 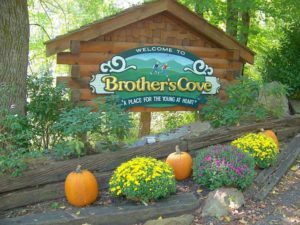 While there are many Pigeon Forge cabin rentals in the area, the units at Brothers Cove Mountain Resort all have their own special “Smoky Mountain” charm and unique character. The resort community is within short driving distance of pretty much everything in Pigeon Forge with only a few additional miles to Gatlinburg. “Mountain Dreams” truly has it all. . . Dollywood, Ober Gatlinburg, golf, horseback riding, hiking, outlet mall shopping or just plain old fashioned sight seeing. 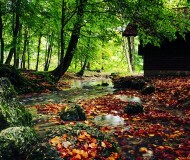 Better yet, the entire area is conducive to welcome both family visits to romantic getaways. Trust us there will be more about the multitudes of leisure activities in upcoming articles. 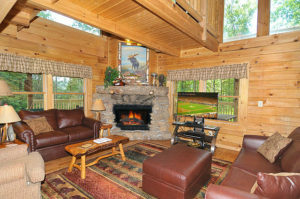 One visit to the Smoky Mountains, this amazing cabin and Brothers Cove resort is all it takes to see why when it comes to Pigeon Forge cabin rentals. Booking “Mountain Dreams” is a must. 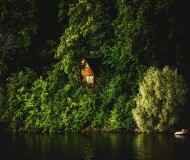 Please bookmark cabinspots.com and our sister travel site in which this article previously appeared; skycapnews.com. Stay tuned to continued travel news and reviews. Safe travels!